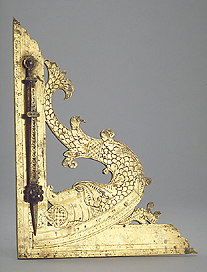 This instrument in the form of a set square is decorated on both sides with a pierced and engraved image of Jonah and the Whale. On the obverse there is an arc below this decoration engraved with a diminishing scale numbered 3, 7, 16, 18, 24 and 30 and divided to 1. Along the vertical edge is a diminishing scale 1 to 45, numbered by 1 from 1 to 5 and numbered by 5 from 5 to 45, divided to 1. Along this edge is the date 'ANNO 1573 IAR' and the inscription 'DER MASSSTAB AVF EISENN KVGELL'. Along the horizontal edge is a linear scale numbered 1 to 6, divided to 1. An engraved swivelling plummet index, with a cast bronze lion's head fixed to it as a weight, moves over the arc. The plummet is rivetted to the vertical edge. Along the vertical edge of the reverse is a diminishing scale 1 to 70, numbered by 1 from 1 to 5 and numbered by 5 from 5 to 70, divided to 1. Along this edge are the inscriptions 'MEIN HOFNVNG STET AVF GOT' and 'DER MASSTAB AVF PLEI KVGEL'. Along the horizontal edge is a diminishing scale 1 to 8, numbered by 1. Along this edge are the inscriptions 'ALLEIN GOTT DIE EHER' and 'DER MASSTAB AVF STEIN KVGELL'. The instrument was presented by Max Rosenheim in 1896 and is described in F. A. B. Ward, A Catalogue of European Scientific Instruments in the Department of Medieval and Later Antiquities of the British Museum (London, 1981), p. 106, no. 314.